Northrop Grumman has been awarded a $517 million agreement to develop up to three Long Endurance Multi-Intelligence Vehicle (LEMV) hybrid airships for the U.S. Army. The United States Army has ordered a huge hybrid airshiplonger than a football field to watch over battlefields in Afghanistan by theend of 2011, according to the airship's builder Northrop Grumman Corporation. The company has received a $517 million Army contract tobuild up to three of the huge military airships, called the Long EnduranceMulti-Intelligence Vehicles (LEMV). Such airships would serve as surveillancestations at 20,000 feet (6,096 meters) above sea level and could stay on watchfor as long as three weeks at a time. A LEMV would also have the capability to carry a 2,500-pound(1,113 kg) payload, and still zip along at 92 mph (148 kph) if necessary. The302-foot (92-meter) airship would typically have a cruising speed of just 34mph (54.7 kph). "Our offering supports the Army's Joint MilitaryUtility Assessment that this disruptive innovation must meet the Army'sobjective of a persistent unblinking stare while providing increasedoperational utility to battlefield commanders," said Alan Metzger,Northrop Grumman LEMV program manager. A heavy-lift configuration could transform the LEMV into asky transport that carries up to 15,000 pounds (6,803 kg). The U.S. Army has also conducted militaryairship field trials for a tethered balloon that would carry radar to helpweapon systems track and shoot down cruise missiles. 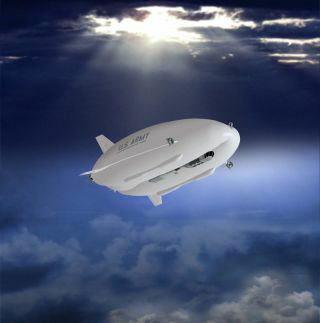 Unlike blimps or lighter-than-airvehicles, hybrid airships such as the LEMV are heavier-than-air and requireboth vertical thrusters and forward movement to stay aloft. But theirincorporation of lighter-than-air gas for buoyancy allows them to stay up inthe air for much longer than traditional aircraft or drones. Northrop Grumman hopes that the LEMV could eventually alsoprovide for homeland defense as well as military surveillance over distantbattlefields. But the airship would first have to undergo tests anddemonstrations in Afghanistan after the 18-month target deadline. Civilian airships have also witnessed resurgence inpopularity. E-Green Technologies' Bullet 580 recently became the current world'slargest airship by inflating to its full length rivaling a 23-floorbuilding.